The power that comes with iOS 12 allows you to get the value for your money from faster speeds and better performance. You can have face time with 32 people at a time, control devices used by your family better as well as switch to the camera with a personalized time stamp, better notification control, and many more lovely features. Upgrading from your settings app should be a simple tap and acceptable task but sometimes things happen and you get the prevalent unable to check update error which may be caused by limited storage, bad network or server error, device compatibility, etc. Don't worry; these tips will fix iOS 12 unable to check for update error for you on any device. The device that goes to upgrade should have at least 2.77GB free storage space. But 3GB or more will keep you on the safe side. 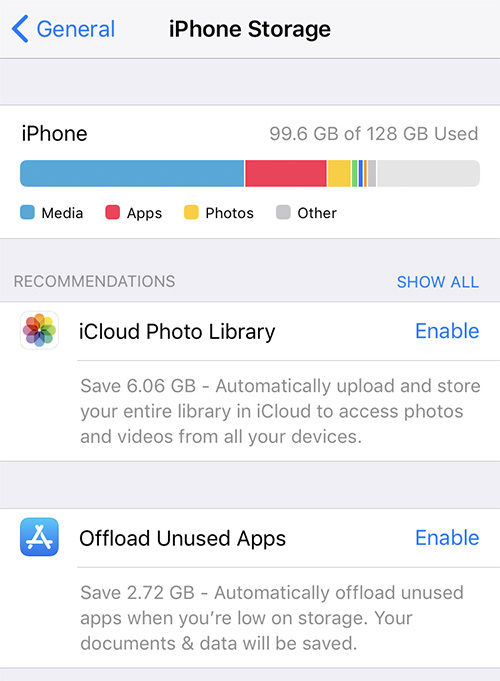 Delete unnecessary files and apps then try upgrading to iOS 12 from your settings app again. To check it, go to "Settings" > "General" > "iPhone Storage". 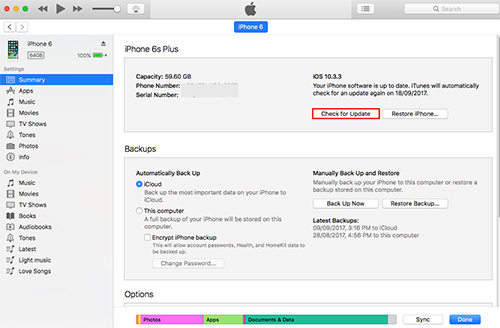 Meanwhile, remember to make a backup of the phone data on iTunes and ensure your iCloud backups are up to date. If you have any error retrieving the data after the update, Joyoshare iPhone Data Recovery app can always help recover lost data and ensure data safety after the upgrade to iOS 12. If your iPhone or iPad get unable to check for update when upgrading to iOS 12 error message based on the condition where you have enough space, the first step is to refresh your device memory. You only need to press the power button as if you want to restart but when the apple logo appears, release the power button and click the home screen. To restart the settings app, simply exit to the home screen, swipe to close the settings app then tap the settings button to access general updates then update to iOS 12. Updating your iOS system takes up a lot of battery power and a low battery may not allow you to make a full upgrade. You have to connect your charger throughout the whole process if you have a faulty battery that may die while the system is upgrading to avoid crashing your device. A battery below 50% will definitely give you "unable to check for update" error which is easy to fix. After getting the required charge, you can go back to your settings app and click the update button again. Your network speed will determine the time your phone takes to download updates for iOS 12. The file is bigger than iOS 11 and other former versions. For Over The Air (OTA) from iTunes and the settings buttons will give you an error button and sometimes to fix this iOS update error, just change to a strong network. Apple server may reject your update if you attempt to update on a public Wi-Fi or an established insecure network. You have to make sure you use the right network. Or reset network settings by heading to "Settings" > "General" > "Reset" > "Reset Network Settings". OTA upgrades are easy and fast which is why this is the best way to update your iOS system if the settings button update is not working. You need to have the latest iTunes version on your computer for this to work perfectly. Plug in your cable and connect to the device then go to "Summary" > "Check for Update" from the iTunes app. You have to ensure the upgrade is complete before disconnecting your device as the computer acts as your server during the OTA upgrade. The device may be overloaded with processes or you may have too many apps running in the background preventing the device from connecting to the apple servers. If all these methods are not working a hard reset may be necessary to reboot the memory but this has to be your last option. You simply need to press your power button until you see the apple logo then swipe it down to switch off. You can then switch on after 5 or 10 minutes then go to your general settings and check for the iOS 12 update icon. If you have installed the iOS beta installed on your iPhone or iPad, your device will be detected as having the latest system on the apple server and you will not get the link to upgrade to iOS 12. Guarantee your network settings are reset to avoid errors in updates after deleting the beta version. Go to your network settings on the settings app then click the reset network settings icon. 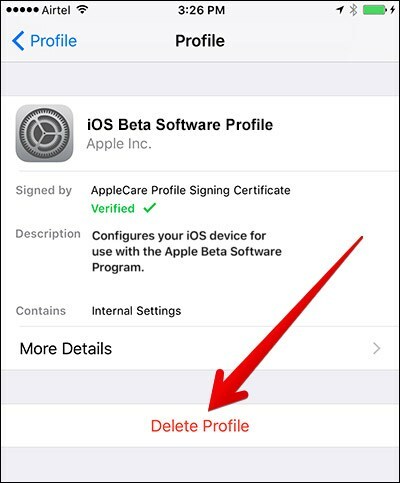 You can then go to the general settings then select profile and device management to delete the beta version. Restart your device then check the settings, you should be able to see iOS 12 in the new system update options than proceed to upgrade. If all the network and device conditions are working properly, apple may be the problem. Apple server failure is not rare, when new system updates are introduced, the number of devices connected to the server at a time may be too high. You need to check the apple system status to see if everything is green. If you see a red or yellow icon, you have to wait and try your update at a different time. Upgrading your device to the latest system version is necessary if you intend to get the best service from your iOS device. If your iPhone, iPad or iPad touch is unable to check for update when upgrading to iOS 12, these steps will help you access your update. However, every system update comes with a data loss risk and you have to brace for one by ensuring your iCloud and iTunes backups have all the data you need on your device. If you lost data through a device crash, deleting an unintended file or the phone resets while you are updating, Joyoshare iPhone Data Recovery will be your savior. You can simply use it to recover data from iTunes and iCloud after your iOS 12 upgrade.